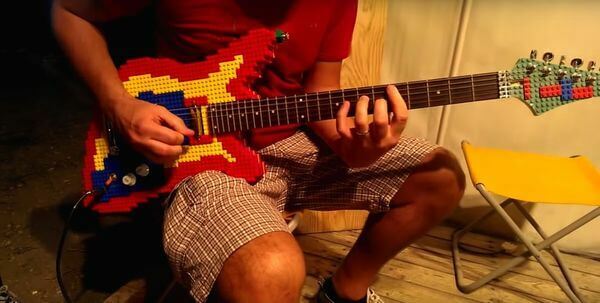 Home / Entertainment / This Perfectly Functioning Guitar Made of LEGO Blocks is Incredible! This is exactly what Nicola Pavan, an Italian guitarist did when he designed an electric guitar instrument where every hand will be drawn and tempted to touch and hold it. This guitar is absolutely made up of colorful Lego blocks, except for the hardware, electronics, and neck. The instrument has parts that are engage with each other and overlapped to tightly hold each segment together. Fyi, no glue or any other sticking material was used to this amazing piece of work. ‘You might be thinking that under that layer of Lego there is some type of wood that forms the support, but you are wrong’, Pavan wrote on his website. ‘The body is made entirely of Lego and without any kind of glue between the various blocks’. Just to give you a trivia about this masterpiece, this Lego guitar is 100% functioning and could create genuine guitar sound. Although, after a couple of songs, the Lego guitar’s tuning gets weak and collapses but who cares so much about the sound it creates, for as long as it is made up of Lego, it’s all that matters!